Want your skin to glow, gleam and glisten? 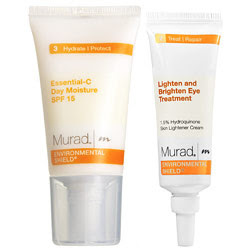 Then you simply have to try the Murad Lighten & Brighten Eye Treatment and Essential-C Day Moisture SPF 15 Set. (Say that three times fast!) Each of the two products in this set works to keep your skin bright, shining and simply gorgeous. I've been a fan of both of these products for months, so finding them in a set was like having a dream come true, prayers become answered, the heavens open up ... okay, you get the picture. First up, the Lighten & Brighten Eye Treatment. This little tube seriously works wonders! Every time I use it, I just know I'll wake up without any bags, puffiness or dark circles near my eyes. Only the tiniest amount is needed -- smaller than a dime-sized dollop. Once you squeeze it onto your finger (I like to use the pad of my index finger), slowly massage it into your undereye area and out toward the outer corners. Doing this on a daily basis will ensure that any unsightly eye problems will be kept at bay! I love all the oils it's formulated with -- orange, grapefruit, rosa damascena flower, clove flower and sage -- which just make me feel like I'm doing something extra special for my skin. And, of course, who could forget the Essential-C Day Moisture SPF 15? This moisturizer works to fight against free radicals and sun damage. The latter is perfectly obvious, as the name itself tells you there's SPF protection in the formula. The moisturizer is light, creamy and non-drying, and it's not at all irritating (quite a feat as my skin is very sensitive!). As with the eye cream, it's not necessary to use a huge amount -- I recommend about a quarter-sized dollop, massaged especially into the nose, cheeks, forehead and chin. I like to use it at night and let it work its magic as I sleep ... though it is perfectly okay to use for day as well. This set retails for $75 on Sephora's website. Quite a bargain when its full retail value is $107! So go ahead, lighten up. Thanks for this post! The eyecream sounds so fab! I am always on the hunt for the perfect eye cream!